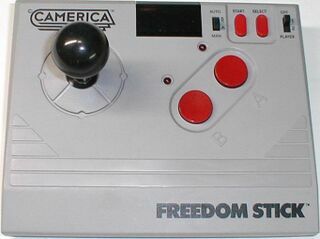 The Freedom Stick is a third-party arcade stick released by Camerica. It is compatible with a number of systems - the Sega Master System, Nintendo Entertainment System, the Atari 2600 and 7800 and a variety of home computers using the DE-9 standard. The stick itself is a simple wireless arcade stick with turbo features. It takes four AA batteries. Similarities with the NES Advantage caused Nintendo to sue Camerica shortly after release. Main article: Freedom Stick/Magazine articles.